Bonaventure Tuxedo, now of Mineola, New York is a name you can trust! Servicing all of Long Island, Queens, Manhattan and special orders throughout the United States, our expertise in style and tailoring has been the cornerstone of our business for more than 35 years. We have been styling for weddings, confirmations, communions, graduations, proms, and corporate events for years, let us help you with your next event! Bonaventure’s inventory consist of Traditional, Classic, Contemporary, Slim fit and linen to super 120’s wool; Tuxedos and Suits, sizes from boy's to men's. We have exclusive industry and retail relationships that allows us to customize your suit or tuxedo either on site or by submission for special order. The exclusive on the spot tailoring provided here at Bonaventure Tuxedo allows you to SEE, FEEL and TRY ON your perfect suit or tuxedo! All of our designer tuxedos are of the finest quality fabric at affordable pricing. We offer two options for our customers, "Purchase" or "Rental." has been a family owned and operated for two generations. Our original location was established in Garden City, New York and as we have specialized our services we have recently moved to a more convenient location near the parkway! We pride ourselves on going above and beyond our clients and guests' expectation thus creating consumer loyalty and trusted brand for over 35 year.So if you or your ushers are out of the area all you need to do is go to a Tuxedo store, get measured, than Email, Fax or Mail the Measurements to us. Nationwide fitting...convenient for your out of town groomsman is just another option for you. We thank you in advance and hope to be a part of your Prom, wedding or special occasion. Look Good! Feel GREAT! At Bonaventure Tuxedo! Bonaventure Tuxedo is a family owned and operated business established in 1975, we are aware of the importance of each individual’s special event, whether it is a wedding, prom, college formal, or black tie affair. 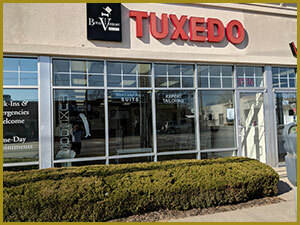 Bonaventure Tuxedo is dedicated to providing customers with highest quality products and services.